Prezi in PowerPoint? It's called pptPlex! 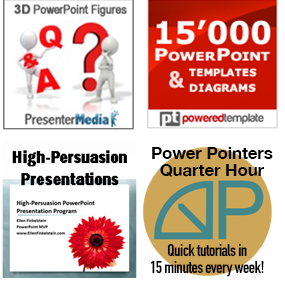 You are here: Home / Resources / Prezi in PowerPoint? It’s called pptPlex! pptPlex is part of Microsoft Labs, a place for experimental software. You can download it for free here. When you double-click the file you downloaded, and approve installation, you see this screen. Because pptPlex is experimental, you need to agree to send usage data to Microsoft, then click Next. Accept the agreement and click Install. When you install pptPlex, you get a new pptPlex tab on the ribbon. I tested pptPlex in PowerPoint 2013. But when I opened PowerPoint 2007 and 2010, I saw that pptPlex was there, too! Not only that, but a box opened up with a link to a tutorial video! I didn’t get that in 2013. Here’s the link to the brief tutorial. You need to start by creating some slides using PowerPoint’s regular tools. I found this approach very comfortable, because I’m so used to designing on slides. Then, you need to organize those slides into sections. 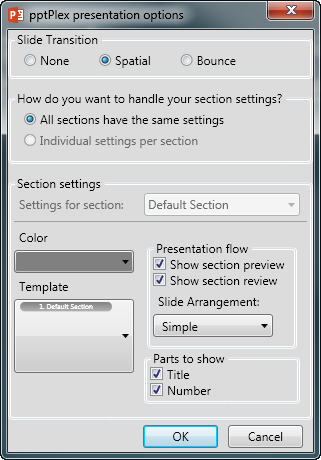 In PowerPoint 2010 and 2013, you can create sections by right-clicking in the left-hand pane and choosing Add Section. Then right-click again and choose Rename Section to give it a meaningful name. In PowerPoint 2007, there is no section feature, so it’s part of pptPlex. On the pptPlex tab, click Insert New Section. Enter the section name to create a section slide and drag the slide wherever you want it. When your slides and sections are done, you insert a canvas background. Microsoft has created some prototypes — some are quite inventive. 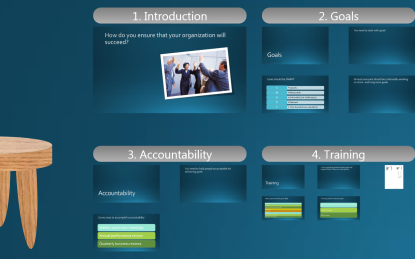 The purpose for the canvas background is to create an overview slide that displays all of the presentation’s sections and slides. 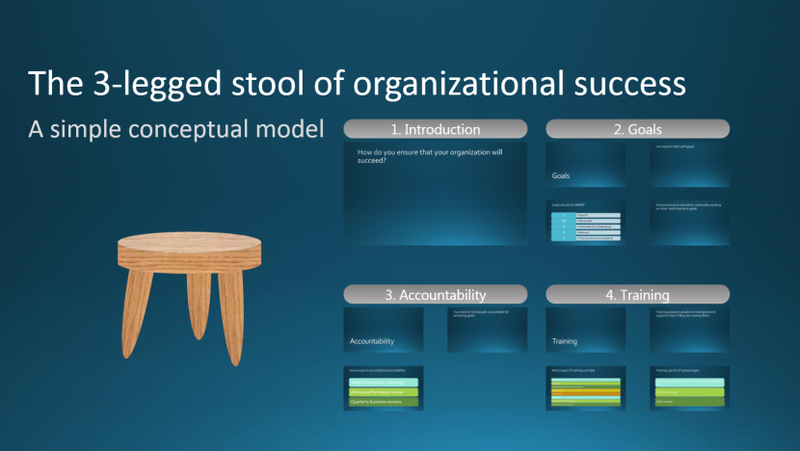 In this way, the audience sees the entire structure of the presentation. When you present, pptPlex zooms in and out of the sections and slides in order. Click the Canvas Background button on the pptPlex tab of the ribbon to select a background for the canvas. I chose Custom Simple. It appears as a 1st slide in the left-hand pane. You can resize the box where the slides will appear, or move it. You can also format this slide’s background to match the rest of your slides. The backgrounds include explanatory text, which you should delete. You have to try out the various canvas backgrounds to see how they look and function with your content. Do this before you make changes, because displaying a different canvas background discards your customizations. I used the Canvas Background slide as my title slide. After seeing the overview it created, I didn’t think I also needed a typical title slide. Here’s how it looks in Slide Show view. The area on the right is the overview, displaying my 4 sections and their slides. You need to choose a canvas background before you can present with pptPlex. Click Advanced Options to set some options, such as the slide transition, color, template, presentation flow, and more. Be careful; some of the options aren’t pretty. I found the Bounce slide transition to be unsettling. Click Add Live Content to insert other files, such as Word documents or Excel spreadsheets. This is a nice feature — again, you can zoom in and out and pan. Click the From Overview button to view your presentation. It publishes to pptPlex format. Then you see the canvas background slide with your slides divided up into sections. You can choose From First Slide (or From Current Slide) to skip the overview slide. During the presentation, the mouse doesn’t work. I used the right arrow key but you can also use the Spacebar, Enter key, or any other key that moves to the next slide. On each slide, you can zoom in to show content in detail. You generally zoom in using the wheel button of your mouse. You can also pan around the slide by dragging with your left mouse button. This is a great way to show tables, charts and spreadsheet data so that the audience can read them easily. You can also use the wheel button to zoom out at any time, showing your audience the context of any slide. Here you see the first, overview slide zoomed in to the section that contains the sections and slides. You can only use the Esc key when you aren’t fully zoomed into one slide. Apparently, Microsoft is working on a multi-touch version of pptPlex. That would be quite cool. Unfortunately, all the Tell Me More links on the pptPlex tab just go to a generic Help item about add-ins — useless! Although animation and transitions don’t work in the pptPlex system, remember that you still have a regular PowerPoint presentation. So, you can present the slides without using the pptPlex canvas by going into Slide Show view as usual. I think that pptPlex is a well-kept secret. Try it out and share your impressions! Thanks for the article. As you know, I’m no presentation novice, but I never would have figured it out on my own. Still has a way to go before it’s “like Prezi”, but I’ve never been all that impressed with Prezi anyway. Too easy to focus on the “flash” instead of the presentation. I’m not inclined to try it. As it is PowerPoint, generally speaking, creates a disconnect with the audience. Too many bullets, too much data, etc. In essence all the things you teach and preach not to do. The example visuals shown on the Microsoft tutorial showed how to zoom in on visuals that contained too much detail and/or too small fonts; again the things we teach not to do. So I’ll pass on pptPlex. Bob, Well it certainly took me longer than I was planning for when I started writing the blog post! Therefore, it does not seem to be very productive to try learning a new piece of software that was only experimental, never meant for prime time, and has already been abandoned. T, I look at it a different way. Note that they talk about “popular demand” and are responding to it. Remember, that it’s just an add-in to PowerPoint, so you create a presentation as usual and can choose to deliver it as a pptPlex or as a regular presentation. The more people who download and use it, the more likely it is that Microsoft will incorporate its features into the next version of PowerPoint (or maybe the next one after that — who knows?) It isn’t really a lot to learn — I’d say that figuring out how to use it effectively is the big thing — which is true of PowerPoint as well. The concept is good but Microsoft seems to have ditched the project. Does the computer that you are using to during the presentation need to have pptPlex installed in order for it to work? I think so. 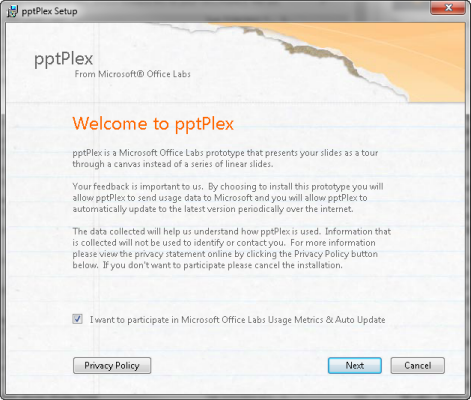 pptPlex becomes part of PowerPoint by adding a new tab to the ribbon. So, you couldn’t deliver using pptPlex without it installed. I’m very impressed with pptPlex. It’s just so easy to use. I’ll never understand why Microsoft abandons things that work well. Well, they’ve kept it up there for a couple of years. I’m sure they count the downloads. Pass the word around and maybe they’ll make it an integral part of the next version! If you save the file and take it to another computer will all of the plex stuff work? Or does that computer also need plex installed? The other computer needs pptPlex installed. it didn’t work for me in Office 2013. have you done anything special to enable it? Mohammad, I did this in 2013. Perhaps try downloading and installing it again? Just in case you were working on a Surface, it needs a full version of Windows. I did it, but it raised error again and again. I’m not using Surface. I use Win 8 Ultimate and Office 2013 Pro. I doubt that there is any formal support for PptPlex, but try searching online. How powerful this would be, if animations on the slides worked too… it would be amazing. Is there just no way that the animations created in slides work in pptplex? On one presentation, I was disappointed to see my animations within slides didn’t work in pptPlex. On another, they did. Something called Layout: Body appeared in the custom animation box, indicating that the “enter” animations were working. On some slides this appeared in the custom animation box ALONG WITH the usual indications of the enter animations. On these slides, the animation occurred twice: all the way through and then all the way through again. So I had to remove the usual indications and leave only Layout: Body. Therefore, I’m cautiously optimistic that, if you build in custom animation, pptPlex will retain it. Do you know if pptPlex is SCORM compliant? Can it be used with Articulate Storyline 2? Marvy, I doubt that it’s SCORM compliant in itself, just as PowerPoint isn’t. No idea about Storyline, why don’t you try it? However, I recently wrote about PowerPoint Mix, which does have an option to export in SCORM format. You can read that post at http://www.ellenfinkelstein.com/pptblog/discover-powerpoint-mix-interactive-online-lessons/.